Cognac is home to the World's most famous digestif and attracts visitors from all over the globe throughout the year. Situated in Poitou-Charente it has a population of 19,500 along with 80,000 hectares of vineyards and an amazing 58 hectares of well maintained parks and gardens. It is possible to visit, and taste, the most famous brandies in existence - Cognac is home to Remy Martin, Hennessy, Martell and many other smaller producers while Courvoisier is just down the road in the pretty market town of Jarnac. Cognac sits in the second sunniest region of France with generally mild Winters and long warm Summers. This climate is of course perfect for both the vineyards and sunflower fields that characterise the area. Fly to Bordeaux, La Rochelle, Poitiers or Limoges (all between 60-90 minutes drive), take the Eurostar/TGV from the UK to Angouleme or drive from St Malo/Caen. Prices have risen steadily over the last five years and continue to rise in 2005 (forecast 10-15%). However, at an average cost of 1148€ per sq m the Poitou Charente area is particularly good value when compared to 2348€ per sq m in Provence and 1410€ per sq m in France as a whole. At the base level you could buy two excellent plots of land totalling around 4,500 m2 for 50,000?. This land comes with existing planning permission and access to all utilities. At the cheaper end of the housing market you could buy a two bed town house in a good residential area within 5 minutes walk of the beautiful main square in Cognac town centre for around 120,000?. With a slightly larger budget of 175,000? you could find a beautiful 3 bed stone house in one of the outlying villages, with a small garden and easy access to shops and restaurants. Once you hit the 200-300,000? market you see a really strong demand from UK purchasers and supply is slightly more limited. A proper search will however still unearth a Charentaise stone house with four bedrooms and walled garden of 1000m2+. Finally for those with budgets of over 350,000?. This is still a healthy sum in the Charente where property has not reached the dizzy heights of Provence, the Cote D'Azur or Languedoc Roussillon. Buyers in this category will still be able to purchase a decent family house, in good condition with pool and views out over those World famous vineyards. Do you know Cognac better than we do? Do you have photos of Cognac? 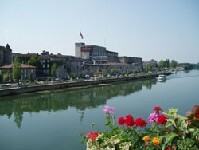 Cognac is in the extreme west of the Charente department, right on the banks of the Charente river. Access: Fly to Bordeaux, La Rochelle, Poitiers or Limoges, take Eurostar from the UK to Angouleme or drive from St Malo/Caen after taking the ferry. Economy: The town is host to several different producers of Cognac and many associated businesses have sprung up to support the industry. Interesting fact: Home to the world famous digestif Cognac.